Our weather patterns down here seem to match those back home. We get extremely warm weather in the low 30sC only to have a cold snap of -2C several days later. It is quite a shock to be wearing shorts and hiding in the shade one day only to have to wear winter clothes and staying indoors the next. A new experience for me is ducking large chunks of ice falling off palm trees. Not only do these icicles make loud noises when they fall on trailer roofs but they dent cars and bruise heads. It is interesting to say the least. In spite of the strange weather a Northern Mockingbird has claimed our yard for its own. It is very territorial and does not tolerate other birds near the feeders and seems to especially dislike House Sparrows. Not a bad thing. After observing it for several weeks I decided to feature it in this article. 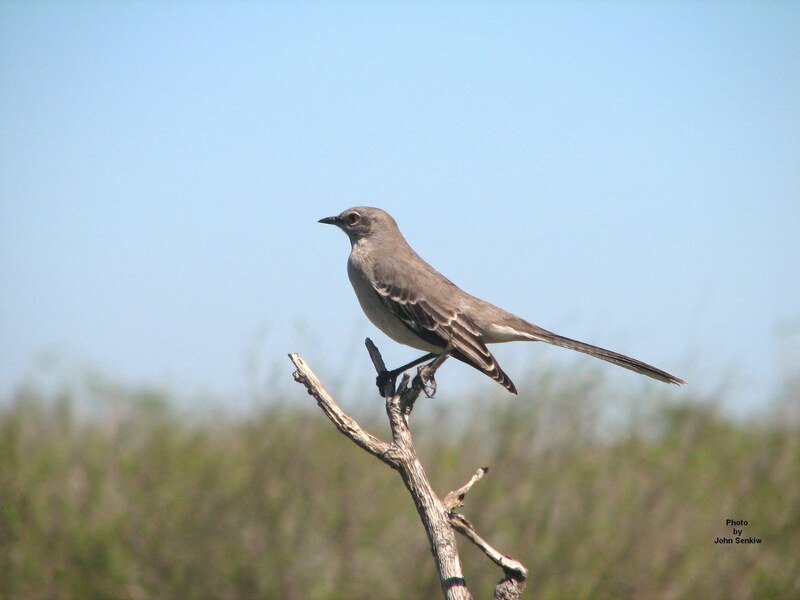 In North America the Mockingbird is the most common member of the family of mimics (mimids) and the one most likely to copy (mimic) the sounds it hears nearby (hence its name). Most often it imitates the sounds of other birds but it has been known to mimic cats, babies crying and even lawn mowers starting up. When it is not mimicking, particularly during breeding season, it is a fine songster in its own right. Perched atop a large bush or small tree it will sing for hours often well into the night much like the robins back home. Its habit of singing in the night has earned it the nickname of Nightbird in some localities. The Northern Mockingbird gets its “first” name simply because it is the most northerly member of a much larger family of mockingbirds found in the tropics. We in North America refer to it simply as the Mockingbird or the “Mocker”. Except in Mexico it does not have any other mockingbirds in its range. In the US the Mocker is found all along the east coast, most of the lands that drain into the Mississippi and throughout the southwest to the Pacific. It is non migratory and lives only as far north as snow melts shortly after it falls. In Canada it is relatively common only in southern Ontario. Elsewhere, it is a vagrant which has even been seen in Saskatchewan. The robin-sized Mockingbird is a rather nondescript grey bird with white wing bars and a long tail that it likes to raise when agitated. When it takes flight its large white wing patches literally jump out at an observer providing an excellent field mark. It is one of the few birds that is easier to identify in flight than perched. Males and females are the same. This week’s picture was taken at Laguna Atascosa near South Padre Island. In this photo it is shown in its typical Mockingbird pose. The profile is such that with a little practice it can be identified just by its shape. For those travelers who visit the US be on the lookout for it. The deep freeze that hit most of the continent did not miss us. Temperatures have been abnormally low with several days of frost and with daytime highs in the single digits (Celsius). Throw a heavy fog into the mix and we have a recipe for disaster. Freeways were closed and by morning houses and palm trees were covered with ice. As the day progressed and temperatures rose ice falling off palm trees was a real concern. As a result birding has been slow to say the least. On the bright side, I have not had to shovel anything. For birders one of the big differences between Foam Lake and Weslaco is that there are many more species of pigeons down south. Foam Lake has three species of pigeons; the Rock Pigeon, the Mourning Dove and the Eurasian Collared Dove. There are eight species of pigeons down here one of which (the Inca Dove) I covered in Article No. 72. 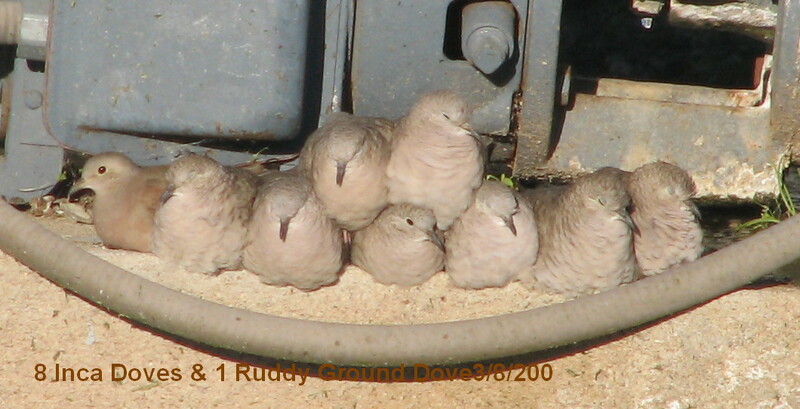 In this article I will cover two doves – the Common and Ruddy Ground Doves. The Common Ground Dove, as its name implies, is quite common across the southern US although its numbers have been decreasing in recent years. The Ruddy Ground Dove is very similar to the Common but, as its name implies, it is ruddier or redder especially the male. Both species are very small – about the size of buffed up House Sparrows. Because of its rarity, sighting a Ruddy in the US is a highly sought after prize for birders although it is very common farther south in Mexico. Although both species can and do alight in trees they are most often seen in pairs or small flocks feeding on the ground (again, as their names imply). At close range or with binoculars the dark spots on both species’ wings can be seen easily and are very similar to the spots on the Mourning Dove’s wings. These spots help to distinguish the Ground Doves from the similar and very common Inca Dove which has no such spots. 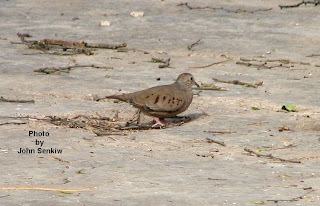 I have seen only one Ruddy Ground Dove in the US, but many Common Ground Doves and do not recall ever hearing one. Apparently both species make a soft two note call. This week’s photos were taken several years apart; the Common Ground Dove was shot in Texas in 2006, the Ruddy Ground Dove was taken in Arizona in 2008. The Arizona shot is of wild birds in the great outdoors and is not staged in any way. The picture was taken at 4:00PM on a cold but sunny 10C day on a ranch on the Red Rock Indian Reservation. The eight Inca Doves and lone Ruddy Ground Dove (far left) were huddled together on the concrete base of a water pump facing west trying to stay warm. Cute! The picture is priceless. Enjoy. Hello from southern Texas. Fortunately our trip down was uneventful and we even saw a few lifers along the way. We left on January 10th just escaping the storm back home, but at the same time not driving into the blizzard that was raging in South Dakota and Nebraska at the time. By the time we had to drive through that region the storm had passed. Talk about snow and snowplows. Thankfully, the roads were not icy so traveling was good, although, the quite heavy ground level drifting was mesmerizing at times. We did see some birds along the way that we found interesting. From southern Saskatchewan to Kansas there were pheasants everywhere. We also saw three birds that breed in the high Arctic in the summer and spend winters south of the tree line well onto the prairies. The first were the ever present Snow Buntings that are common in the Foam Lake area. The second were lifers for my wife and me. At first we thought they were off-colour Snow buntings, but a quick check with our birdbook showed them to be Lapland Longspurs, cousins of the Horned Larks. Because Lapland Longspurs do not winter in the parkland region of the prairies only on the open short grass prairie, I had never seen them during my younger years. In the years that we have been there we have simply overlooked them. Finally, my wife noticed a hawk floating over the freeway in North Dakota directly in front of us. When we got close it flared clearly showing the distinctive markings on its underwings identifying it as the Rough Legged Hawk. I had seen them before but my wife had not so she got a second lifer and near home. When we arrived in Texas the birding community was abuzz about the sighting of a White Throated Thrush (formerly White Throated Robin). We have not seen it yet, but hope to soon. As compensation, we did see our first Fulvous Whistling Ducks. Since we have been coming here we have seen another quite rare tropical robin (now thrush) that is the national bird of Costa Rica, the Clay Coloured Thrush. They have actually started nesting here in the Rio Grand Valley, but are not common by any means. In the last year or so ornithologists have done some renaming in the thrush family. Through years of common usage members of the thrush family that had spotted or striped abdomens were called thrushes; those that were blue were called bluebirds; the rest were called robins. As always, there were a few exceptions. Now, with the changes, bluebirds are still the same, but all robins without red breasts are now thrushes. Therefore, our robin is still the American Robin as is the much rarer Rufous Backed Robin – both have red breasts. 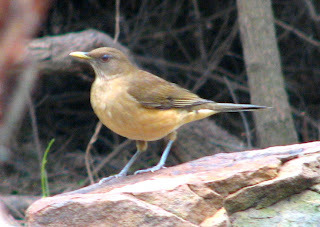 This week’s photo of the Clay Coloured Thrush was taken several years ago in McCallum when it was still known as a robin. In a colour photo it looks like a washed out American Robin with a light tan coloured breast and no white throat; in black and white it looks just like the American Robin.